We just received the wonderful news that former On Spec editor, now murder mystery author Eileen Bell (writing as E.C. Bell) is this year’s winner of the annual Bony Blithe – The Bloody Words Light Mystery Award! Her book, “Dying on Second“, is the 4th in the continuing series of Edmonton-based mysteries, featuring the amateur sleuth and “speaker to departed spirits”, Marie Jenner. If you aren’t intrigued yet, you should be. And she’s working on Book 5, so you have some catching up to do! At the moment, the editors of On Spec are busy reading the 500 + stories that were sent in during our open submissions period. Some will be short-listed for further discussion, and many will not be. The process is lengthy, because we’re all doing this in our spare time. It goes without saying that we appreciate the patience of writers who trust us with their work. If you are new to this business, you need to know that writers have to develop a thick skin, and forge ahead in spite of the setbacks. This article by editor, Barb Galler-Smith might shed some light on the life of a magazine editor, valiantly trying to find the right stories for the reading audience. 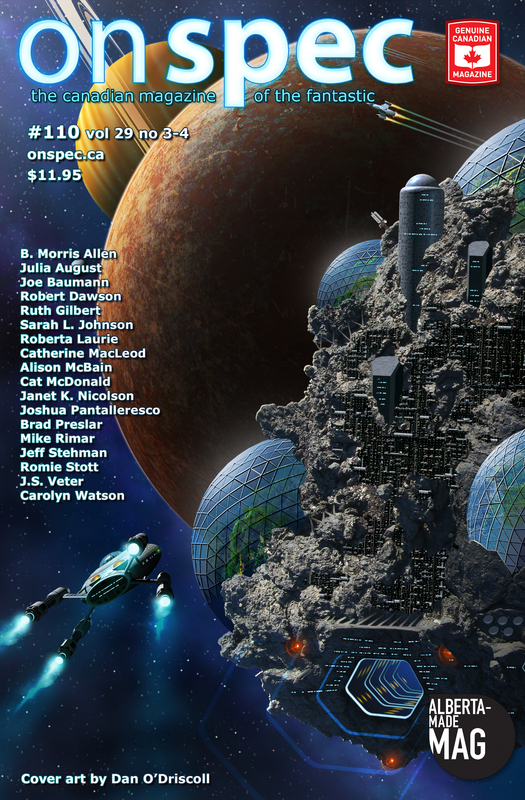 On Spec editors and friends will be participating at Sci-Fi City: An Evening of Networking with On-Spec and Co., presented by the Writers Guild of Alberta in conjunction with the Edmonton branch of the Canadian Authors Association. The event takes place Monday, April 30, and details are available here. It’s aimed at young writers 18-30, and we will be available for Q&A, mixing and mingling in an informal setting at the Almanac. We can give advice about networking opportunities, and best ways of presenting your work to a prospective publisher, or how to get started on the self-publishing journey. RSVP is requested for this Facebook event, so we hope to see lots of young writers there. Have a look at Volume 28 No 4! We are expecting delivery from the printer any day now, so send us your order or better yet, subscribe! The Rosetta Man is an intriguing alien first contact novel–with non-verbal aliens. The story starts out in New Zealand, but soon travels. Every nation desperately wants control over the aliens and since Estlin (an empath who’s mental shininess often attracts small animals) is the only one who can communicate, he gets dragged everywhere along with them. I enjoyed the international aspect of the story. Though the main character is Canadian, there are characters from New Zealand, China, America, Indonesia and Samoa among others. I found the novel to be very well-researched with lots of small details that gave the story authenticity. (Though most of the math–okay, all of the math–was over my head…) The intrigue of who would get control of the aliens and the mystery of what the aliens themselves wanted kept me turning pages past midnight. Quibble: One of the subplots involved a Greenpeace ship and was told from the point of view of marine biologist, Jeannette. Since Jeannette had a past romantic connection with Estlin, when their paths finally crossed after hundred pages, I expected more to happen. Not necessarily a rekindling of the romance but perhaps an epiphany or realization related to either’s character arc. Nicole Luiken is the author of thirteen published books for young adults, including Violet Eyes and its sequels Silver Eyes, Angel Eyes and Golden Eyes, Frost, Unlocking the Doors, The Catalyst, Escape to the Overworld, Dreamfire and the sequel Dreamline. Her latest release is In Truth & Ashes, book three of Otherselves. She also has an adult thriller, Running on Instinct, under the name N.M. Luiken and a fantasy romance series, Gate to Kandrith and Soul of Kandrith. Nicole lives with her family in Edmonton, AB. It is physically impossible for her to go more than three days in a row without writing. Nicole Luiken wrote her first book at age 13 and never stopped. Nicole wrote her first book at age 13 and never stopped, and she also published in On Spec’s first youth issue.